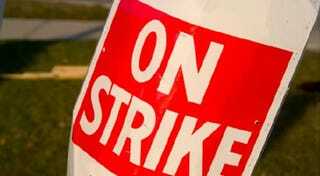 Air traffic controllers in Spain went on a wildcat strike Friday, causing a national state of alarm there. Italian footballers will strike on Dec. 11 and 12. Two American sports leagues have unhappy unions and owners. Should any or all of these strike, well, we can still play FIFA, or NBA 2K, or even Flight Control. We're fortunate that video game performers don't belong to a union and will never walk off the job or be locked out in a contract dispute. That's the basis for this week's challenge, of course. What if they did? Your assignment: Depict video games on strike. There are a number of ways to go about this. You can put Duke Nukem in a picket line. Similarly, you can take a screenshot and replace its iconic characters with scab labor from a lesser game. You can take an iconic picture of labor unrest and 'shop in characters showing their support. You can bury Jimmy Hoffa somewhere in Badwater Basin. Plenty of game characters look like common laborers - obviously there's Mario and Luigi, but also Engineer and even Peter Pepper from Burgertime look like they could belong to a union. I've deliberately chosen a useless picture at the top there to force you guys to get creative. But for most, something's probably already popped into mind. You know the drill: Post your submissions in the comments. The 20 best will get rounded up and published at the end of next Saturday. Meantime, I and the rest of the starred commentariat will approve and promote as many as we can so folks can see them and pass judgment. Remember, if you're trying to get a comment account approved, turning in a worthy 'shop is an easy path to the privilege.